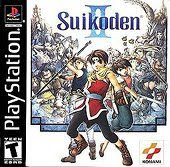 Suikoden II is a role-playing game for the original Playstation console. It was published by Konami in 1999. In the game you recruit characters to battle with you and fight in battles against the opposing forces. Like most RPG's you can buy new equipment, develop new skills, and refine your character's abilities as you progress in the game. Suikoden II was printed in limited quantities and those games didn't sell very well, which prevented a reprinting by Konami. The game received good reviews from the media and has since become a well regarded game with role-playing game fans as well. The limited quantities produced and its high regard make this one of the most expensive Playstation 1 games. Suikoden II sells for about $100.